It’s one of those gray December days that makes me feel like cozying up on the couch with a blanket and a cup of hot chocolate. I know that it’s too warm for snow, but it looks like it could start flurrying any minute. It’s early enough in the season that I don’t mind. It still feels festive to stay inside by the Christmas tree, or even to bundle up and walk through the neighborhood at dusk, looking at everyone’s lights (and, let’s be real, the plethora of horribly tacky but also endearing Christmas inflatables in our neighborhood). It’s also the perfect sort of day for slow cooking. It will be dark by 4pm, at which point we’ll start thinking about dinner and wonder what we have that we can pop in the oven. That’s what this short rib recipe is for. It’s for days when you have hours to while away indoors, when you crave something rich and tender, when you want an excuse to open a nice bottle of red wine before 5. 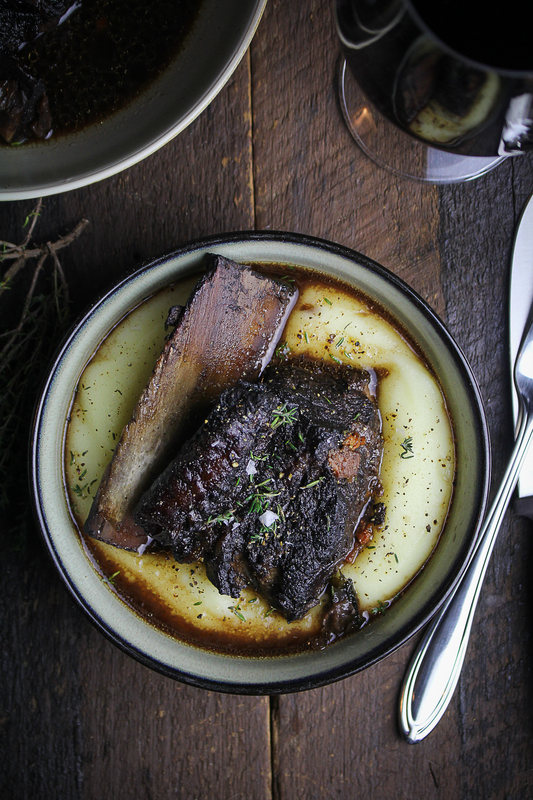 This is your excuse – you’ll need a cup or two of wine to braise the short ribs. 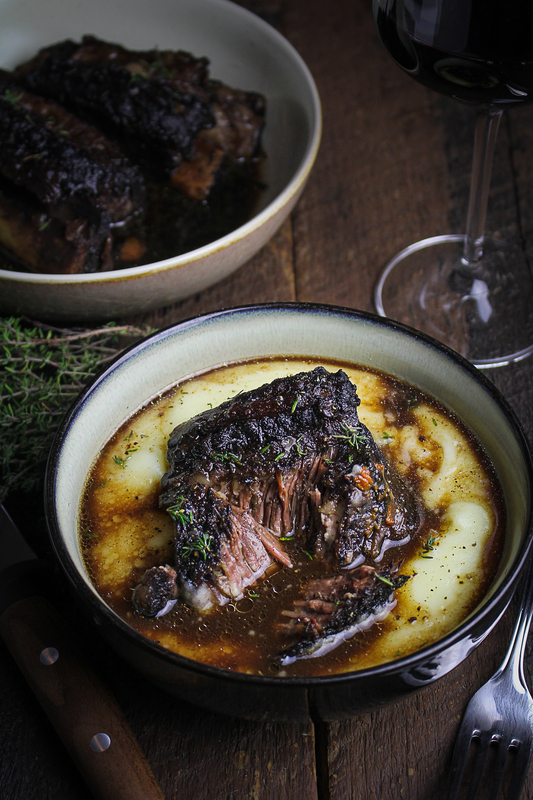 This is also your excuse to stay put while the short ribs roast, filling your house with the savory scent of beef slumping into red wine. 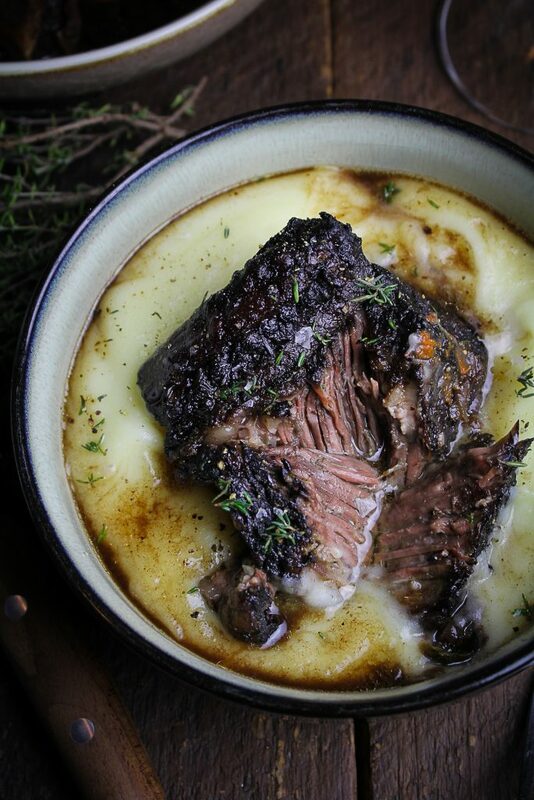 These short ribs are classic but wonderful. 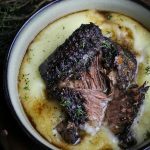 If you do a little research, you’ll find that most short rib recipes out in the world are fairly similar, with only minor tweaks in the order of operations and a secret ingredient here or there. You could argue that this means the recipe is ripe for innovation, or you could just take what’s been tried and tested by the world’s greatest chefs and go with it. 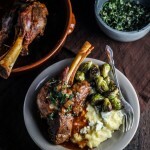 This version is most closely inspired by Sunday Suppers at Lucques, my favorite cookbook. I go through periods when I can’t seem to cook from any other book, as I’ve mentioned before. It also takes a few cues from this Daniel recipe. 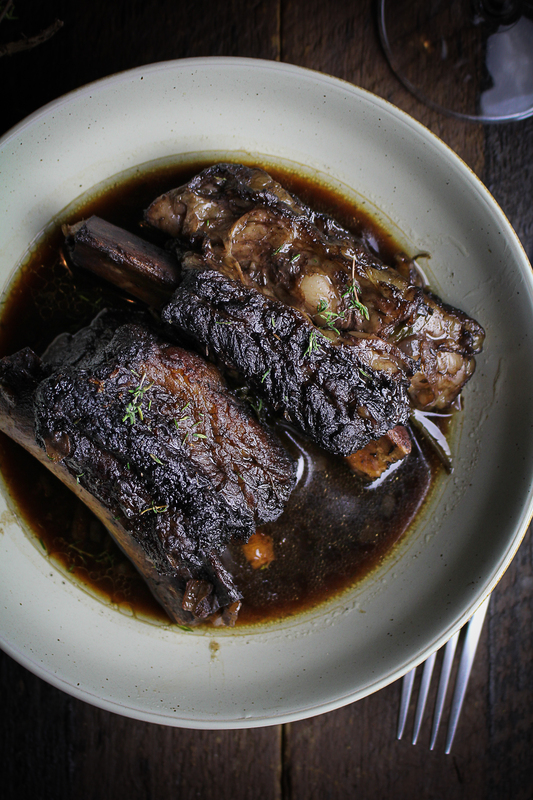 Whichever recipe you use, the tricks I’ve picked up for great short ribs are as follows. One, season generously. Two, brown until caramelized, not just grayish-brown. Three, set aside at least 3 hours cooking time and don’t be tempted to take the ribs out before they are super tender. Four, refrigerate overnight before serving in order to skim and discard as much fat as you can. I had originally planned on doing a follow-up post as well – a short rib grilled cheese sandwich. They offer a similar sandwich, on rich challah bread, at Tatte. We made the sandwiches but, shockingly, they were too rich for me. It turned out I had met my match when it comes to how much richness you can squeeze into one bite. So I’ll save the short rib grilled cheese for another day, when I’ve cracked that recipe. 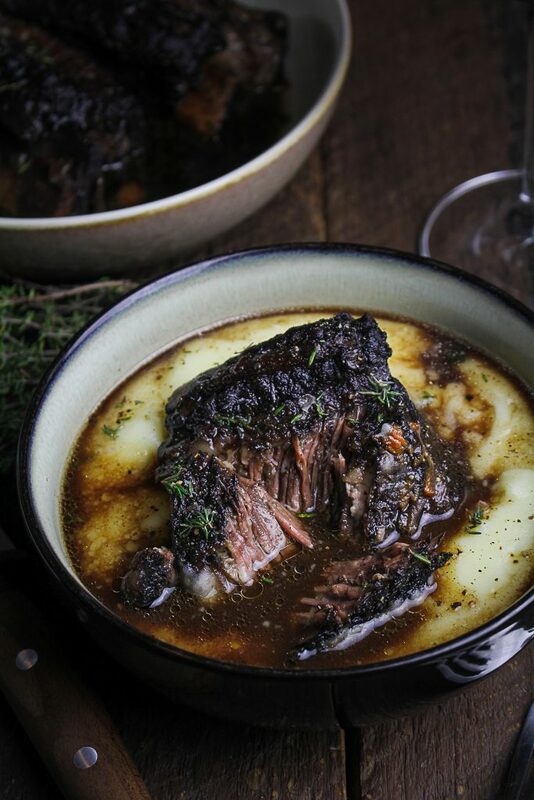 For now, I hope these delicious red wine-braised beef short ribs will warm up your kitchen this winter. Add the red wine, port wine and balsamic vinegar to the pan with the vegetables. Bring to a simmer and scrape up any browned bits stuck to the bottom of the pan with a wooden spoon. Simmer the wine until it has reduce by one third, which should take 5-8 minutes. Add the beef broth to the reduced wine and stir to combine, then place the short ribs back in the pan. They should fit snugly in the pan and be just barely covered by the liquid. Tuck the parsley in to the pan around the side of the ribs. Cover with a lid and transfer to the preheated oven. Roast the short ribs for 2 1/2 to 3 1/2 hours, checking every 30-45 minutes and turning the ribs over in the pan at least once. When finished, the ribs should be completely tender, such that you can easily pull the meat apart with a fork. Remove them from the oven and let cool for 20 minutes. For best results, cover and transfer them to the fridge overnight before serving. When ready to serve, remove the ribs from the fridge. Skim off and discard the hard white fat on top of the dish (there will likely be a lot of this). Preheat the oven to 400F, and return the ribs, uncovered, to the oven for 15-20 minutes – this is to both reheat the ribs and to gently brown the exterior. Before serving, ladle the sauce and vegetables out of the pan and strain through a fine mesh strainer. Discard the vegetables. Serve the ribs on mashed potatoes, gnocchi, or buttered egg noodles, topped with the strained sauce. Also when does the balsamic vinegar get added? Hi Courtney – Thanks for catching those omissions! I’ve updated the recipe so hopefully it’s clear now. How many people does this serve? I am trying to just feed 2 of us! Also is port wine necessary in the recipe, or can you just add another 1/2 cup of the red? 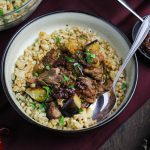 Hi Jillian – This feeds 4-6, but the leftovers keep well and are even more flavorful the next day. 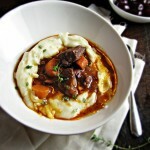 And you can certainly use another 1/2 cup of red wine instead of port. Port is sweeter than wine so you might want to add just a pinch of sugar to balance it out, but I would taste it before adjusting!